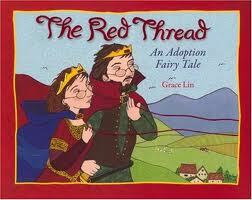 In the Red Thread by Grace Lin, a king and queen feel a mysterious pain. They realize that someone is pulling at their hearts. They seek long and far to find the one pulling at their hearts, and find that it is an infant in China. They are told that the child is theirs, and so they take the child home to be their princess. This book is vibrantly illustrated, and incorporates a Chinese legend that those destined to meet each other are connected by a thread. The books incorporates some Chinese culture, and also leaves a clear message to adoptees that the adoptive parents feel a pull on their hearts which leads them to the children they adopt. This book could be good for families that have been formed through adoption, with children up to age 10. The story is fun and portrays adoption in a very favorable light. Some cautions to consider and questions to ask as you read this book, though: it provides a simplified version of an adoption process. Also, by using the concept of people being destined to be together, it could be seen as suggesting that no other placement (including with the first family) would have been possible. I’ve recently read on blogs written by birth mothers that the concept of adoptions being “destined” is a bit difficult – did God or fate decide that the best way for these two people to meet was to have the baby born to a birthmother in difficult circumstances? Stories told that way seem to view birthparents as “vessels” rather than as individual people. This is a fun story. It can be used to communicate to your children that you love them and feel connected to them. And it can also be a great opportunity for you to intentionally ask yourself, “How did I end up as the parent of this child?” Is it fate? God trying to bring good out of a difficult situation? Random chance? Your answer will most likely color your child’s understanding of his or her life story. Find this post helpful? Why not Sit in the Front Row? Sign up in the top right corner. Don't forget to check out Adoption at the Movies on Facebook! This sounds like a very sweet story, even if over simplified. I really like that Chinese culture is intertwined.